Installing the plugin is extremely simple. Search for Contextual Related Posts in your Plugins » Add New screen and hit Install Now. The plugin will automatically add beautiful thumbnails at the bottom of your WordPress posts. Contextual Related Posts has an in-built cache for the related posts which makes subsequent page loads only need a single database query! This means that installing this plugin will not slow your site down. Just turn the cache ON under General Options on the plugin settings page. If you prefer more control over where the plugin appears on your site, then we have you covered. Contextual Related Posts has been downloaded nearly half a million times and is currently being used on 60,000+ WordPress blogs. At the end of a post I want to give readers options and this post does the best job of any I have tried over the years. Posts are picked due to content, not popularity. Readers are more likely to click something relevant to the post they just finished reading. That’s how I read other blogs and I expect most other people do the same. Great, sensible plugin that works and gets updated. This plugin worked beautifully upon activation. I tested a couple of related post plugins, and wasn’t happy with the posts they were relating. This one gave me good, relevant results without any fiddling. I wanted to tweak the color of the related post text, and the plugin author thoughtfully included a custom CSS area to do just that. Great job, and excellent functionality. What can I say… plugin works out of the box. What did it for me was the provided API. You can easily customize the whole output with your own html. Even without that (which was all I needed), the provided options provide great amount of customization. I needed a related posts plugin that gives relevant posts based on content and Contextual Related Posts does a very good job combinate with it’s Category and Tag subplugin. With a good cache plugin, no slowness to show. Support is very good and Ajay explained me how to use the plugin with the related posts template of my theme: so I’ve got perfect presentation and efficient related posts. 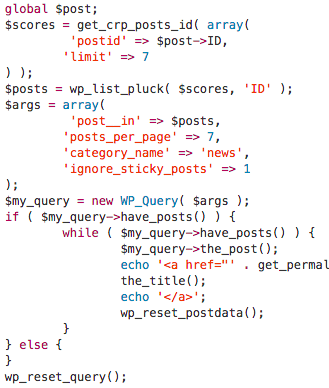 Needed to find some solution to feature Related Posts at the end of each blog post. I also needed to be able to exclude custom post types used by my client’s Events Calendar plugin. I am using a child Woo Canvas theme, and while I like some of the shortcodes offered by Woo, their related posts included the events in with the Related Posts, which was not accurate, while also included events that had expired, which was definitely the most annoyingly horrible thing. Anyway, CRP worked right out of the box. The styling is ok, but that is something I can tweak later on. It works. It works. It works. And that’s what I needed it to do. Then I found this plugin. Contextual Related Posts has everything I need. The default styling (with the “Style attributes” radio button checked) looks absolutely AMAZING on my site. And I have complete control over the thumbnails. I love this plugin!
. View more testimonials . 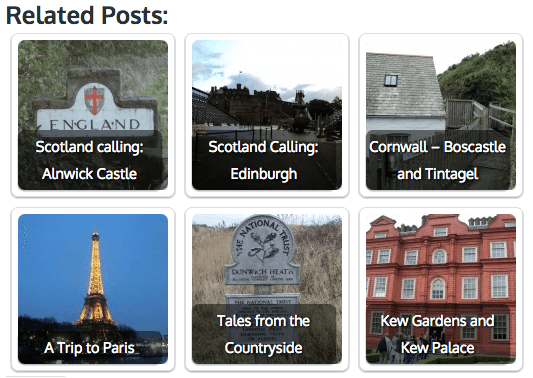 Start displaying related posts on your blog now!